Information about the Ergo Basic The Chattanooga table- ErgoBasic has a critical mix of adjusting features that is praised by many practitioners. A tilt head and Accelerator Pelvic Drop are standard features. Optional extras include an E-Z Tilt Headpiece, allowing operation of tilt, adjustable face opening and a forward drop with one hand from either side of the table. This is the standard table that we use for patient care. We have 3 of these to serve multiple people, eliminating wait time. 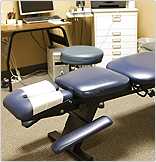 Information about the Flexion-Distraction Cox Technic is research-documented spinal manipulation to relieve lower neck pain, arm pain, leg pain and a host of other spinal related conditions like disc herniation, spinal stenosis, post-surgical continued pain, and pregnancy related back pain. Information about the Intersegmental Traction Intersegmental traction is a means of inducing passive motion into your spine for the purpose of increasing mobility and stretching spinal joints. The discs of your spine have a poor blood supply. Sustenance is accomplished and maintained through spinal joint movement. Proper spinal movement (mechanics) allow needed proteins/nutrients to enter the disc. This also allows for the removal of waste, decreasing the likelihood of bone spur formation (degenerative arthritis). Misalignment of the spine prevents this exchange from occurring. 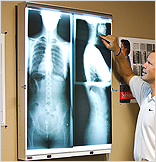 A lack of proper circulation can lead to disc thinning and degeneration of the spine. intersegmental traction helps restore proper motion and prevent this from occurring. 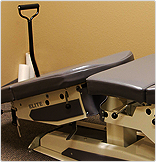 Patients lie supine on a table which has vibrating roller-type cams beneath its surface. These massaging rollers travel slowly up and down the spine. Most patients find this form of traction to be very relaxing and therapeutic. We have 3 of these tables allowing us to treat multiple patients at once minimizing wait time. Information about our X-Ray machine We have our own equipment on site so that we can see a patient, take films if necessary, and show them to the patient within minutes. This eliminates having to go offsite for imaging which can add days or weeks to wait for treatment. We are able to see most of our patients the same day! A device for low impact adjustment techniques, with The Activator "you don't hear the cracks"
Information about the Activator The activator is a small handheld spring-loaded instrument which delivers a small impulse to the spine. It was found to give off no more than 0.3 J of kinetic energy in a 3-millisecond pulse. The aim is to produce enough force to move the vertebrae but not enough to cause injury. 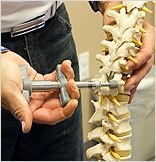 The Activator Method Chiropractic Technique is a chiropractic treatment method and device created by Arlan Fuhr as an alternative to manual manipulation of the spine or extremity joints. The device is categorized as a mechanical force manual assisted (MFMA) instrument which is generally regarded as a softer chiropractic treatment technique.In 2003, the National Board of Chiropractic Examiners found that 69.9% of chiropractors used the technique, and 23.9% of patients received it. The majority of U.S. chiropractic schools and some schools in other countries teach the AMCT method, and an estimated 45,000 chiropractors worldwide use AMCT or some part of the technique.